Yoga is an inspiring way to nurture yourself after the birth of a child. At a time when naturally so much of your energy is devoted to your newborn baby it is also important to look after yourself. Strengthening exercises provide the opportunity for retoning the muscles of the abdomen and pelvic floor. Yogic postures are energising, help to alleviate physical tension and encourage you to be aware of your alignment whilst feeding and carrying your baby. Mindful breathing and deep relaxation bring a sense of calm and balance into your life as a mother. 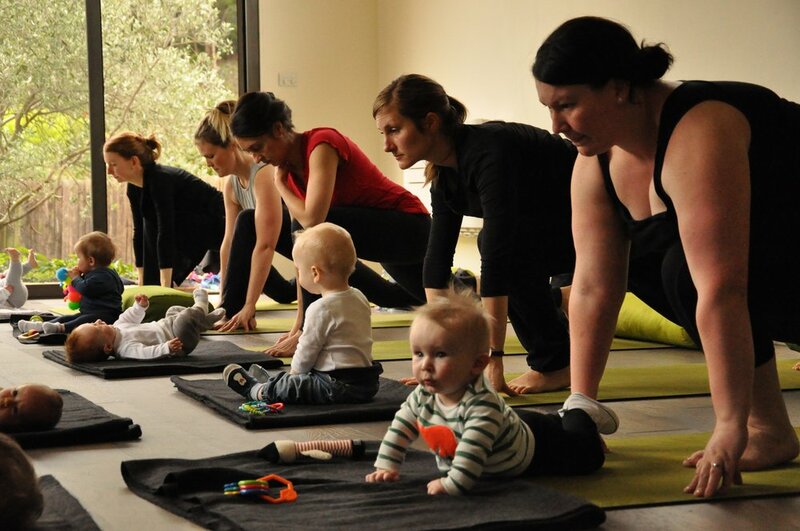 Coming together to practise yoga with other mums and babies is supportive, fun and affirming. Sharing experiences of the joys and challenges of a new baby is integral to the experience of mothering. You are welcome to join level one as soon after the birth as you feel ready to. For some this will be within a few weeks, for others it will be longer. Level two is stronger and more dynamic so requires a degree of postpartum recovery before attending. During class your baby is with you while you participate. Suitable for women who have recently given birth, including those who have experienced a c-section. Also appropriate for those with no previous yoga experience. Suitable for those women who have attended level one or those with more experience of yoga and who have recovered well from birth.